Memorial Day weekend saw the return of this annual festival. May. 26, 2018, 12:30 p.m. 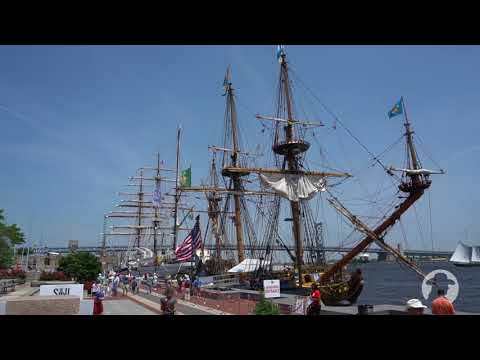 The Sail Philadelphia festival brought 11 wood-masted tall ships hailing from all over the region and the world to the Delaware River waterfront for Memorial Day weekend. Philly’s own Gazela was in the mix, showing off its majestic masts, along with sailing vessels with home ports in Rhode Island, Bermuda and Lisbon, Portugal, among others. Hosted by the Independence Seaport Museum, Tall Ships America and the DRWC, the fest, which has become an annual event, includes opportunities to explore the boats up close and even take rides out on the water. It runs 11 a.m. to 7 p.m. each day, from its start on Friday, May 25 to the finale on Monday, May 28. Tickets range from $6 to $65, available here. If you want to experience the festival virtually, watch the video below, then scroll down for more pics of the sights from the maritime party at Penn’s Landing. Gazela Primeiro was originally built in Portugal at the turn of the 20th century, but has called Philly home since 1971. The Gazela is owned and operated by the nonprofit Philadelphia Ship Preservation Guild. The Kalmar Nyckel is a recreation of a 17th century Dutch ship. Docked in Delaware, it’s used for educational programs across the Northeastern U.S. The faces along Kalmar Nyckel’s sterm depict the elected officials and other benefactors who make the ship’s mission possible. General George S. Patton commissioned the When and If in 1939, naming it after his goal to sail around the world with his wife after WWII ended. The 83-foot Alden Schooner was restored in 2012 and is now docked in Newport, R.I. The riggings on these ships are anything but simple. NRP Sagres is the largest of the 11 participating in the festival, at 293 feet long. The Sagres, which sails under the Portuguese flag as naval training vessel, was active during WWII. A bust of Portuguese explorer Prince Henry the Navigator serves as the Sagres’ figurehead. The 196-foot Oliver Hazard Perry makes its home in Newport, and is named after a Rhode Island-born hero of the Battle of Lake Erie during the War of 1812. Now used for educational and sail training purposes, the ship is designed to serve be accessible to people who are both able-bodied and not. More than seven miles of rigging are used on the Oliver Hazard Perry. When the Hazard Perry’s sails are fully unfurled, they take up 14,000 square feet.